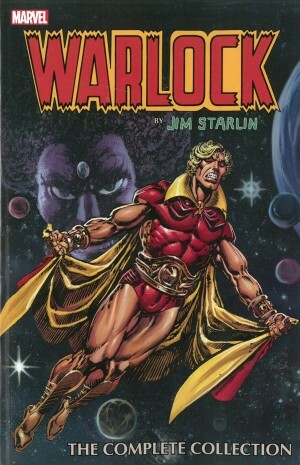 Long before Grant Morrison, Steve Gerber was incorporating the absurd, the whimsical and the surreal into his comics. Yet puzzlingly, until very recently, what should be among the jewels of Marvel’s rich 1970s output was only available in book form as a third of this value for money black and white collection.It can now be found in all its colourful glory as Marvel Masterworks: Defenders volume five. Gerber’s previous Defenders material had been solid superhero stories stretching over four episodes, then quite unusual for Marvel. He’d begun by scouring through an issue reprinting some of Marvel’s daft 1950s horror material, appropriating three individuals and pitting them against the Defenders. Arthur Nagan’s head had been transplanted onto a gorilla’s body, Dr Jerry Morgan had shrunk his own bones, so his flesh hangs loosely in bunches and Chondu the Mystic hadn’t undergone a transformation, but Gerber soon fixed that. Re-christened the Headmen, and joined by Ruby Tuesday, a scientist who’d replaced her head with an organic computer able to mimic anyone’s appearance, this bunch formed the background to an eleven chapter epic. It begins with the brain of flying superhero Nighthawk transplanted into a fawn rescued by the Hulk and the lunacy devolves further from there. 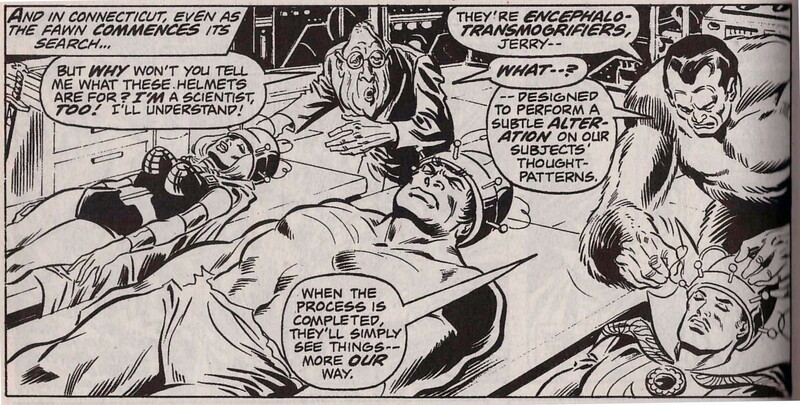 Gerber mashed the stream of consciousness comedy routines of Firesign Theater with new age self-help therapy, sending clown-masked cheerleaders into New York to proclaim everyone as bozos. 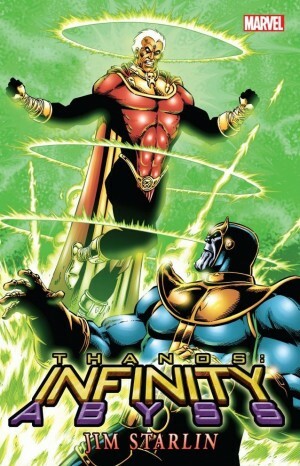 That’s tied in with tentacled alien villain Nebulon masquerading both as a golden-skinned God and a balding everyman. 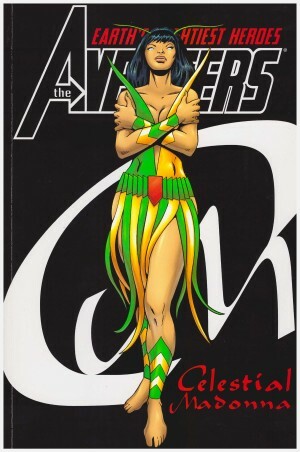 The Valkyrie is jailed while the estranged husband of her mortal persona spends a chapter as a secret agent. Gerber introduced a Soviet superheroine, and an elf with the gun who stops by every few chapters to murder someone. 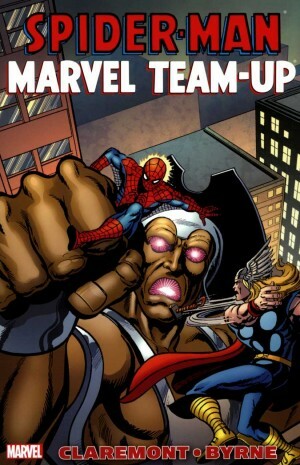 Previously incompetent villains are re-invigorated by a self-awareness course, and there’s a fine role for Luke Cage. This escalating insanity is drawn by the most conservative of Marvel artists, Sal Buscema, here given a rough edge by Klaus Janson’s inks, so adding to the preposterous comedy. No matter what’s thrown in, Gerber never loses control and pulls everything together in the final chapter. It’s an ambition and execution beyond far more highly acclaimed work of the era. 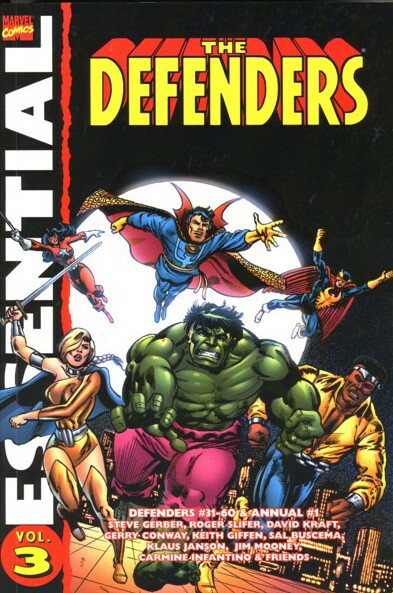 Sadly, that’s Gerber’s penultimate work on the Defenders, and only one other story in this volume comes anywhere near to displaying the same wit and creativity. That’s written by David Kraft, and features Scorpio, once of villainous aggregation Zodiac, and brother to head of S.H.I.E.L.D. Nick Fury, who seems to be hanging around helping him. Scorpio is well characterised as a depressive, cataloguing his life of failure while developing one last career-defining gesture in creating a new genetically modified Zodiac under his control. There’s something of the conflicted Shakespearean villain about him, and Kraft delivers a very satisfying story, albeit neglecting to note how Moon Knight escaped a death trap and having to throw that into the following chapter. It’s all drawn by a young Keith Giffen, then very much and unfashionably in the thrall of Jack Kirby. Kraft and Ed Hannigan’s ambitious attempt to create a story around the science-fiction influenced lyrics of rock band Blue Oyster Cult is dull, and mega-acclaimed X-Men creators Chris Claremont and Dave Cockrum drop by and demonstrate not all their collaborations were pure gold. Art fans may be enticed by early work from Michael Golden, and a short strip drawn by Sandy Plunkett featuring Dr Strange’s girlfriend Clea. The remaining content varies from average to mediocre, but given ridiculously low asking price these days the book has to be worth sampling for the Gerber material alone.